Park City, Utah is to many visitors and locals, the winter activity fun capital of the West. If you are looking for a great ski vacation, where else has 10 ski resorts within an hour drive? Family activities more of what you are looking for? How about sleigh rides to fireside dinners, snow tubing with all the squeals and yells that go with it, or maybe something quieter, more serene, like snowshoeing alongside a winter stream? Park City truly has a winter activity for everyone in your group. 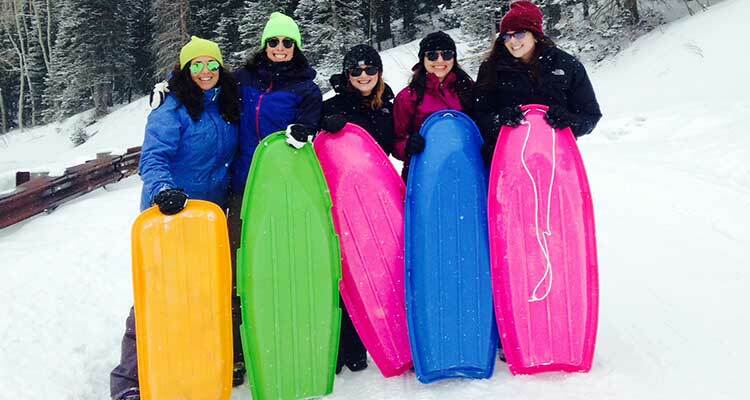 Let Exclusive Excursions show you how much fun winter can really be. See Specialty Winter Activities you might like. Check Out Our Activity Photos! Hot Springs Cave Top Seller! Our tours begin and end with us picking you up at your lodging in the Park City area. The hot spring cave is about 20 minutes from Park City and there is nothing quite like the famous Homestead Crater in Midway, Utah. It is a beehive-shaped limestone rock that is naturally hollowed out and filled with 90° to 96° water. It is about 55 feet tall and 45 feet deep. There is a tunnel through the rock wall to enter the cave. There are built decks and a soaking area for guests to access the crystal clear mineral water. One can go swimming, scuba diving, snorkeling or enjoy a therapeutic soak. Guests are allowed to soak in the cave for up to an hour. 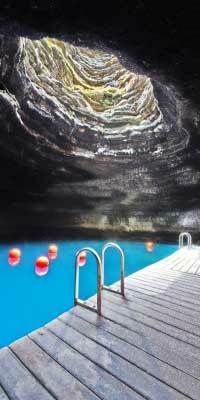 Round trip transportation from Park City and entrance fee to hot spring cave is included in excursion rate. Our snowshoeing tours begin and end with us picking you up at your lodging in the Park City area. Most our local trailheads are within 10 minutes from the main-street area. If you are staying outside the Park City area, we can meet you in a central Park City location or we can pick you up for an additional fee. Snowshoeing among the Wasatch Mountains is a special thrill for anyone willing to slow down and enjoy the beauty. A snowshoe tour is an excellent way to get a better feel for the area, the life that thrives in the woods and fields, and perhaps for those underused thigh muscles too…. Kidding aside, taking yourself or your loved ones on a quiet snowshoe stroll through the crispness of a Wasatch winter is a wonderful way to get closer to nature, release stress, and work off some calories. You may also be amazed by the abundance of wildlife that shows itself during winter months. This can also be an excellent photo worthy excursion with delicate beauty and challenging lighting to make any photo buff smile. Please see below all our different snowshoe tour itineraries and their duration. All our snowshoe tours include complimentary waters and granola bars! A blast for all ages, tubing brings a smile to faces all day long. Good exercise along with exhilarating slide-away fun makes for a perfect activity for couples, friends and families alike. Our tours begin and end with us picking you up at your lodging in the Park City area. We then drive you to Soldier Hollow Tubing Park; which is about 30 minutes from Park City. The tubing session lasts for up to 2 hours. Please see below all our different itineraries and their duration. Yes, you will find yourself humming "jingle Bells", everybody does. Then you'll be laughing, hugging each other and most of all...smiling. This is a great activity by itself or makes the perfect end to a great day exploring other adventures. Any way you look at it, the air is crisp, the blankets are warm and the horses are ready to start prancing. Our tours begin and end with us picking you up at your lodging in the Park City area. The sleigh rides take place in the beautiful rolling hills in the Swiss town of Midway; which is about a 30 minute drive. Please see below all our different itineraries and their duration. Our tours begin and end with us picking you up at your lodging in the Park City area. We will then drive you to the Wasatch Mountain State Park; which is about 30 minutes from Park City. All ages are welcome with machines and tours for any ability level. Easy to learn, fun to master, snowmobiling will bring out a side of you you didn't know you had. On the other hand, if you are an old pro with a sled then you already know the good times that await you. Please see below all our different itineraries and their duration. So you are pretty good at having fun and now you want take things to the next level, or simply pack more into already fun day. We just may have the answer for you. From historic train rides to hot air balloning to scuba diving in a cave we have plenty of ideas to stir your imagination. Want to relax and enjoy an historic and informative Park City Tour or Salt Lake City Tour. Our tours can be customized to your exact desires and we will plan every little detail. We can also take you to places such as Robert Redford’s Famous Sundance Resort, the desert wonderlands in a southern Utah tour, the Uintah Mountains, or even casinos in Wendover, Nevada.